So...we're getting married! And the fact that you are currently visiting this site excites us as it probably means you're planning to join us! We can't wait for our big day and to make it all that bit more memorable we would love to spend it with you as well. We understand that buying flights and accommodation will add up, but for putting in that extra effort to make it across we're going to make sure you have an absolutely fantastic day so we'll be putting on a many course meal (even we've forgotten the count!) and free drinks for the entirety so you won't have to spend a single penny during our celebration together. We've also arranged some fantastic entertainment for each and every one of you to enjoy. We've put together this website to help you out with your plans and hopefully give you some ideas of where to go and what to do if you are coming over to Portugal for an extended stay. Hopefully we'll be able to help you save overall and make it a memorable holidays with all our tips, tricks and recommendations! The ceremony itself will be taking place at the beautiful venue of Palácio de Igeja Velha, Vermoim, Famlicão. Built in 1881, in Vermoim – Vila Nova de Famalicão, the Igreja Velha Palace was for many decades the manor house of an important farm, baroque style with two castellated towers and an attached chapel, the neo-gothic style S. Francisco de Assis chapel. It can be easily reached from the local town Vila Nova Famalicão and the surrounding cities, such as Guimarães, Braga and Póvoa de Varzim. 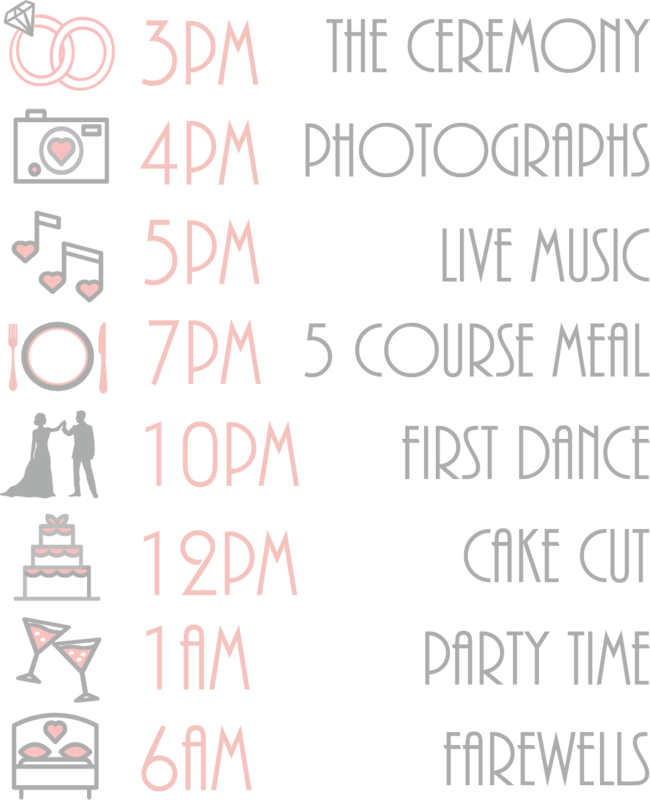 The order of our day will take the following shape, don't forget to give yourself plenty of time to get to the venue, along with a really good nights sleep as traditional Portuguese weddings tend to start later, but with the added bonus that they will end much later! The cake cut itself is something spectacular, which usually occurs around the stroke of midnight, so you definitely don't want to miss out on that! Then the party starts and will go on till at least sunrise! Your presence at our wedding means a lot to us, but if you insist on giving us a gift, then a contribution to our dream honeymoon would be most grateful. Thanks for visiting the site, if you're here to RSVP, you can do so here. So, how do you get there for the best price? If you'd like to find the best deals then we'll recommend that you take a look at a number of different sites. They're all relatively easy to use, so we'll point you in the rite direction and leave it to you from there. EasyJet has been a recent favourite, people have managed to find flights from Manchester to Porto for around £33 and returning around £100. Do bare in mind that the flight comparison sites do include non-direct flights (unless explicitly stated), so please do check the finer details before completing your booking! We've put together a list of ways that can get yourself not just around the area but to the wedding venue itself, we hope this covers each of your routes, if not please feel free to get in touch and we can provide you with some more information. At the airport you can purchase tickets at the ticket machines or even the ticket office (which is open till 9PM). This journey will be completed by Metro. You can also complete this journey via train, there is a shuttle train available from São Bento and you can go via Porto-Campanha station. This journey will be via train. Vila Nova de Famalicao is the nearest town to the venue, if you're travelling to here or staying there, then it's approximately 10 minutes away from the venue in a taxi (or 25 minutes by bus). You can contact Lloyd at lloydyp88@gmail.com. So we've hand picked some of the best areas in Portugal, from local towns and cities to those further afield, if you're coming for a long weekend or a 2 weeks getaway then you'll be able to find some of our highly recommended must-sees! We haven't provided a map because it would have absolutely nothing on Google Maps, so we'll leave that to you! Guimarães is known as the city where Portugal was born, there are two reasons why this is so. The first being, that Angela was born there and the other that it was where Portugal was established. It's a beautiful city and somewhere that Angela will certainly highlight as a must see. If history is your sort of thing, then go and check out the Castle, Igreja de São Miguel, Paço dos Duques de Bragança and then there's the Museu de Alberto Sampaio. The city centre itself is an UNESCO site because of it's precious medieval historic centre, but comes alive at night with the buzz from all the cafes and bars. You can then walk along the iconic city walls and head to the Jardins do Palacio de Vila Flor, a stunning place with beautiful gardens where your ears will be treated to the sound of Jazz from one of the local bars there. From Largo do Toural follow the old city wall and all the old entrance doors, do what the Portuguese do and pop in to Docelia or Clarinha for Tortas de Guimarães ou Toucinho de Céu (a local pastry) and a cheeky beer. After that, you can travel by cable car to the 2,000 ft high peak, which goes by the name of Penha, at the top you'll be met by restaurants, cafes, walking trains and the best views in the city. If football is your thing, then you can go and watch Vitoria Guimarães at the Estadio Dom Afonso Henriques with 29,999 others, maybe you'll be in for a treat and the fixtures will have drawn them against Sporting that weekend so you can see the best team in Portugal too! Póvoa de Varzim, also known as 'Lloyd's Family & Friends Base Camp' is a coastal city in the North of Portugal, an hours metro ride on the B line from Porto & 50km from Guimarães, this is where Angela would escape for relaxing weekends and spend many summer holidays enjoying the beautiful beaches with their undoubting charm and glamour. You're spoilt for choice with a number of bars and cafes along the beach front. Young Povoans can be found at Caetano de Oliveira Square, where they gather at the bars before heading on to the nightclubs that usually open around 1AM. It'll be relatively easy to find any of 'Team Lloyd' in the clubs, just look out for the questionable British dance moves! Have yourself a flutter on the finest silk tables at Casino da Póvoa. The casino isn't your typical gambling establishment, it's focus isn't just gambling but is well known for it's entertainment & highly rated restaurant, dating back to the 1930's. Once you've doubled your money you can wander to Junqueira, Póvoa's busiest shopping district, dotted with boutiques in old traditional buildings. You'll also want to visit the city hall in Praça do Almada and the castle - Fortaleza da Nossa Senhora da Conceição, a typical Portuguese fortress, once built to defend the town from privateers. If you would like to try the local pastries, head to Pastelaria Regata or Ribamar and try the barquinhos or the poveirinhos. 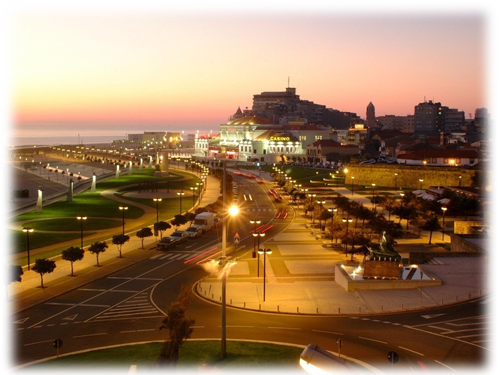 It's also recommended that you take a trip northwards to Vila do Conde and stop in Caximar for a panoramic lunch. If you like your beach sports, Póvoa is perfect, with Volleyball courts every 200 metres, Cristiano Ronaldo's playing Footvolley in their Speedo's and beach tennis being participated in all along the beach. If you're after some competitive Volleyball, head to Praia da Lagoa, they adopt a winner stays on so you'll probably have to beat the happy couple if you're planning on staying on court! Braga is known for its ecclesiastical history/heritage and is Portugal's oldest and is the most Christian city, and home to the country's oldest cathedral. This is where Angela spent her days as an undergraduate student. 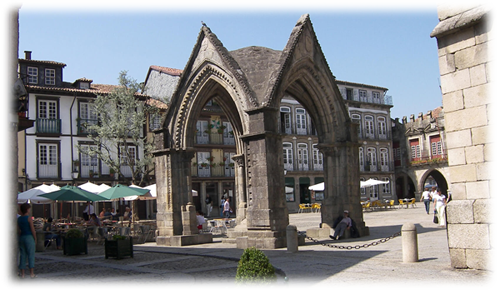 Whilst in Braga you can visit Praça da República where there are cafes, beautiful gardens & the Arcada fountain. Do a spot of people watching in one of the oldest cafes in town (Cafe Brasileira) and appreciate the Art Decor style, another hint would be to try the 'Frigideiras' (a bit like a Cornish Pasty) in Cantinho das Frigideiras. 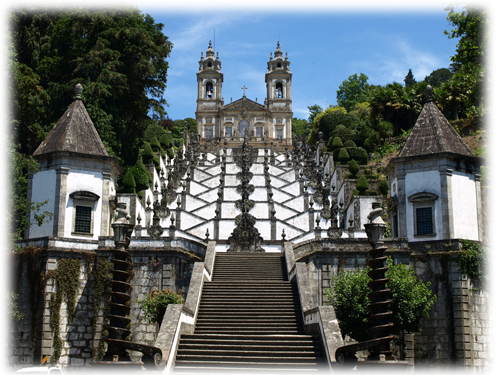 The spectacular Sé (a cathedral) which is Braga's main attraction, dates back to the 11th century. You can also check out Santa Barbara gardens that overl the imposing medieval wing of the former Archbishop's palace. As the evening draws in you must go to Bom Jesus, a Neoclassical church based on the top of the city, the views are outstanding. You should head up there for the beautiful Bom Jesus sunset. Whilst there you can also find the oldest funicular in the world that is powered by water balancing. Outside of Braga you will find the stunning National Park Peneda Geres , imagine the Lake District but with more inclines and declines and lakes warm enough to go for a swim, with the added bonus of the lack of Inbetweener's style caravan sites. Just a few of the thing's to see here are the many waterfalls, mostly the one near the old frontier station at Portela do Homem, and the Vilarinho das Furnas village, whenever the Vilarinho das Furnas Dam is low enough. Champanheria de Janes - Champagne and Tapas, need I say more? Cozinha da Se - You'll need to book at this fine dining establishment! Indian Tandoori Restaurant - Portugal also has strong links with India too, so why not try a Portuguese style Indian curry? Spirito Cupcakes & Coffee - Have a cake or an ice cream during the midday heat!